Looking for a dance or yoga class close to home? 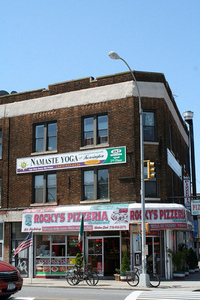 There is no reason to look any further than Namaste Yoga of Kensington at 482 Coney Island Avenue. They are the first neighborhood yoga studio in Kensington, welcoming patrons to come and gain self-confidence while improving physical and mental health. Namaste Yoga was founded by Wilhyn Larsen, a former corporate executive. She has over twenty years of experience in the arts, and brings her talent to this unique dance studio. The studio offers a wide variety of dance classes for every level and interest, including: Belly Dance, Zumba, Pilates, Tai Chi, Cardio Dance, Turbo Kick, classes for kids, and more. Pricing is competitive and there are often discounts and specials available. Call 347-533-6226 for more information.